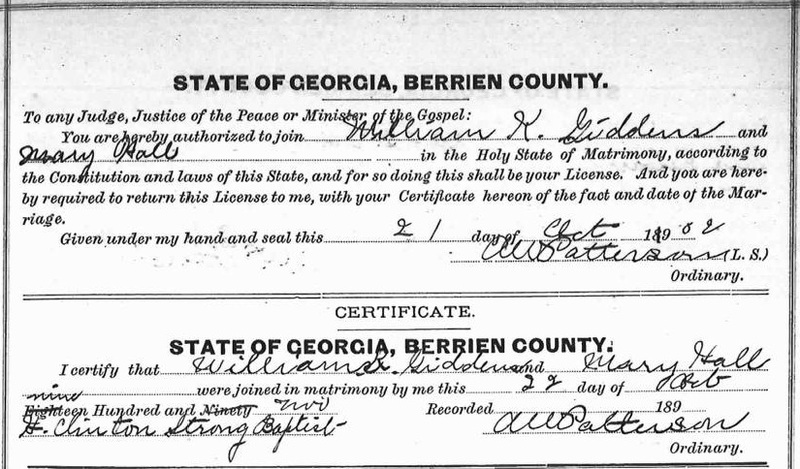 Recent reseach encountered the marriage certificate of William A. K. Giddens and Mary Hall. The significance of the documentation is that many Internet histories list her name as Mary Hale. William Anderson Knight Giddens was born January 3, 1851, in Lowndes (nka Berrien) County, Georgia. 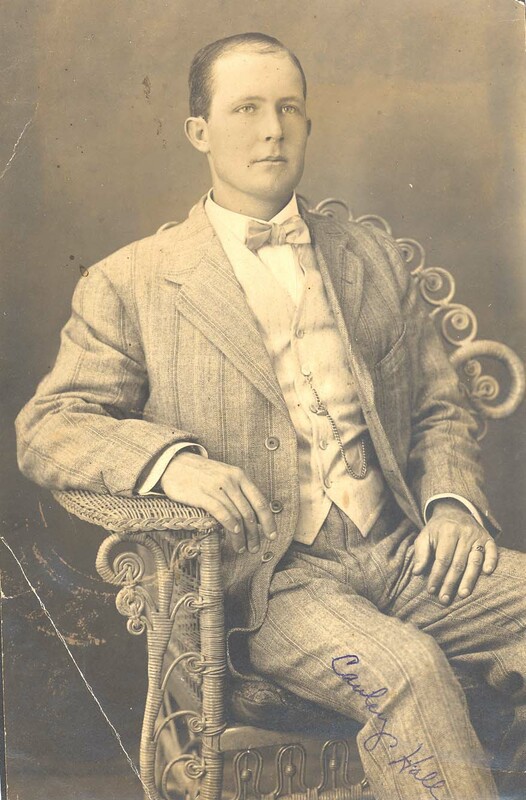 He was the son of William Moses Giddens and Elizabeth Edmonson. He was the great grandson of William Anderson Knight, patriarch of the Knight family that first settled the area now know as Ray City, GA.
William A.K. 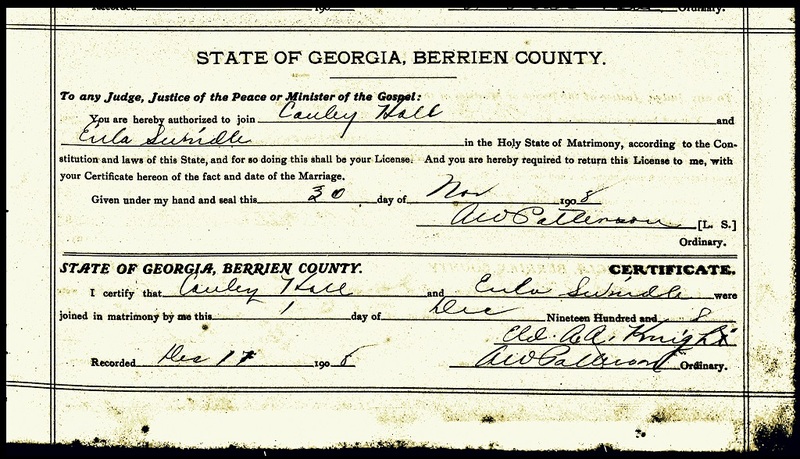 Giddens first married Fannie E. Baskins, born November 25, 1853 in Lowndes County, Georgia. William and Fannie made their home in Berrien County and raised their family there. The couple was married nearly 40 years. Fannie E. Baskins died May 26, 1892 in Rays Mill, Berrien County, Georgia. Ten years later, William A.K. Giddens remarried. 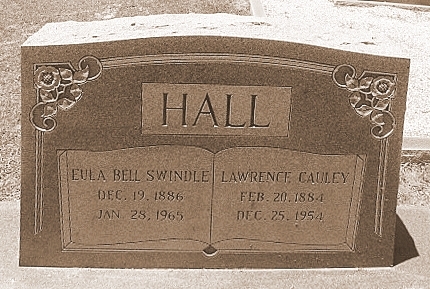 The marriage of William K. Giddens and Mary Hall was cut short by her death in 1904. William Anderson Knight Giddens and his two brides are all buried at Beaver Dam Cemetery, Ray City, Berrien County, Georgia.